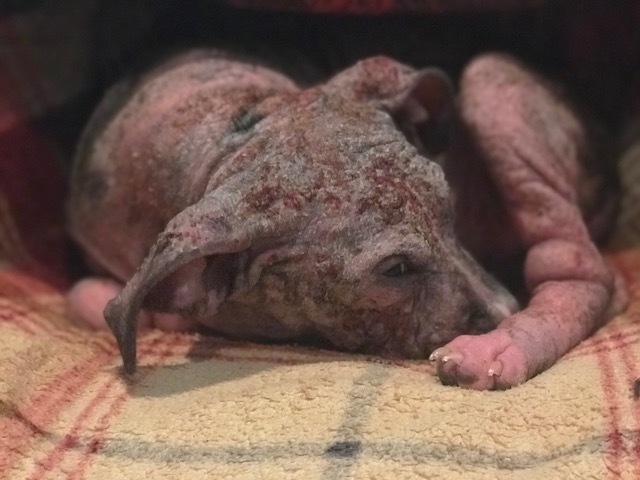 On June 22, Onslow County Animal Services (OCAS) in Jackson, North Carolina picked up an emaciated, nearly-hairless stray dog with a severe case of Demodectic mange. Adoption First Animal Rescue specializes in saving death row dogs from euthanasia. 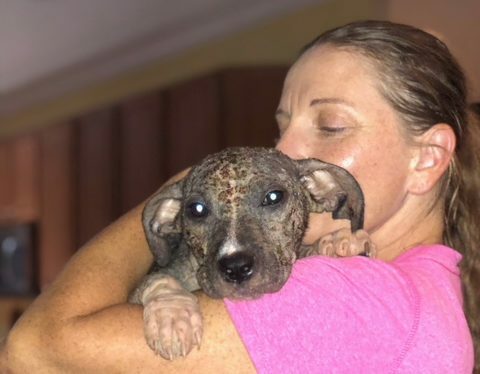 They pulled the pitiful pup out of the shelter and placed her with one of their seasoned foster moms, Heather Corradino-Llantada. The moment she took the dog in her arms, Heather knew something more serious than skin mites was wrong. The poor pup was burning up with fever. Heather rushed her to the vet where her temperature registered at over 105 degrees. 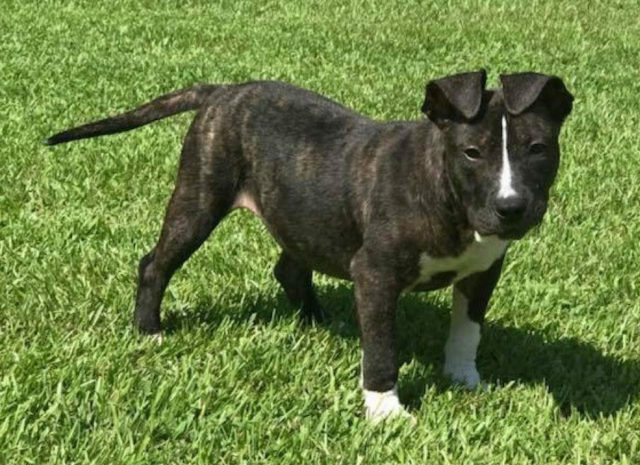 Workers at OCAS had guessed her age at 12 weeks due to her size, but the vet determined she was actually six-months-old. Life as a sickly stray had stunted her growth. She was soon diagnosed with anemia and a potentially deadly case of Canine Distemper. Heather named the puppy Amaani – which means hope, aspiration, and desire – to help give her strength in the tough days ahead. As difficult and heart-wrenching as it was to watch Amaani struggle, Heather was more than prepared to help her fight. During her military career, she received medical and surgical training that has proved invaluable to her work as a foster pawrent. She chooses to take in the most difficult cases; the most desperate underdogs in need of physical and emotional healing from their various ailments. 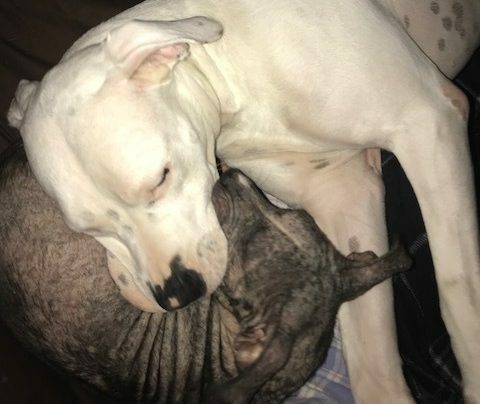 Heather’s home is filled with former “challenges”, including four Pit Bulls that once suffered from Demodex like Amaani. In all, she has 11 permanent rescue pets – nine dogs and two cats – in addition to a near-constant stream of special-needs fosters. She was extremely fearful, depressed, and shut down when she first arrived, but after weeks of gentle care and reassurance, she learned how to trust. Now, her favorite spot is snuggled up on the sofa or “spooning” in bed! 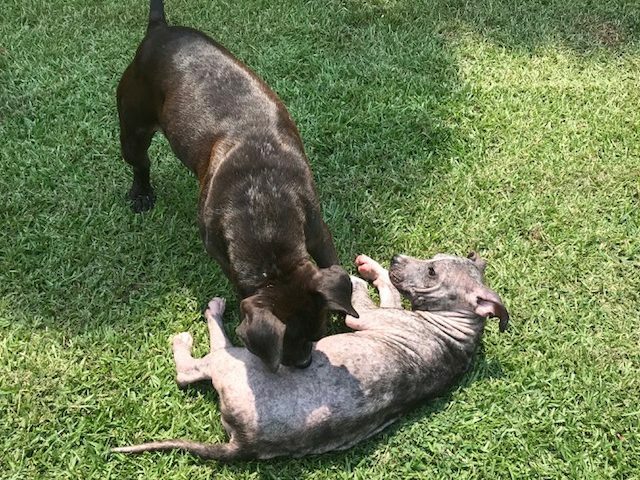 Just six weeks since her rescue, Amaani is completely unrecognizable from the pitiful pup she once was. Without the devoted foster care Heather provided, she would not have survived, let alone thrived. Now that she is well, Amaani is ready to move on to her forever home and make room for Heather’s next special foster pooch. She would do best in a home with at least one other dog to play with. She also does well with children over eight, and despite her healthy interest in Heather’s cats, has never shown signs of aggression. If you would like to learn more about Amaani, send inquiries to adoptionfirstrescue@gmail.com or visit adoptionfirstrescue.com. 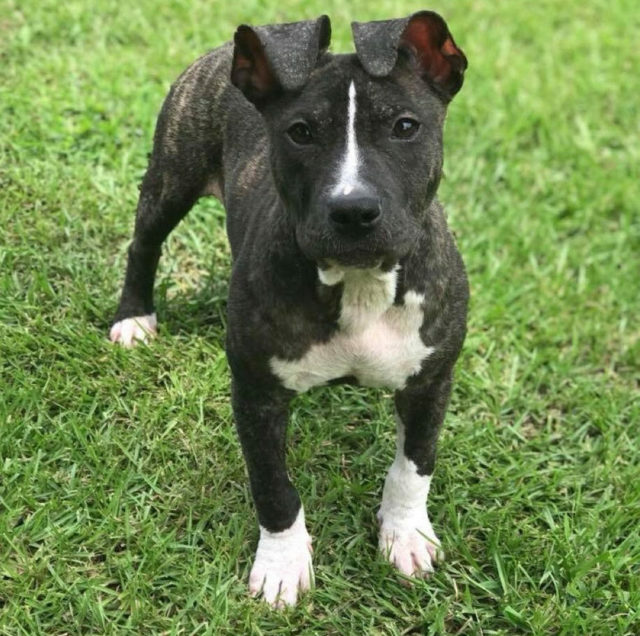 Even if you cannot adopt, please share her story so we can make sure this sweet, strong micro-Pittie finds the wonderful home she deserves!